These Asparagus wrapped in Prosciutto are so delicious, different and easy to make for a Christmas side dish. I’m always trying to find new recipes and preparations. This one is so tasty and will be a hit! You just need asparagus (the thicker ones will be best to use. I found great quality at Costco and they were quite cheap too) and a good quality prosciutto since it’s the “show off” ingredient for this recipe. I cut the prosciutto slices in half (lengthwise). 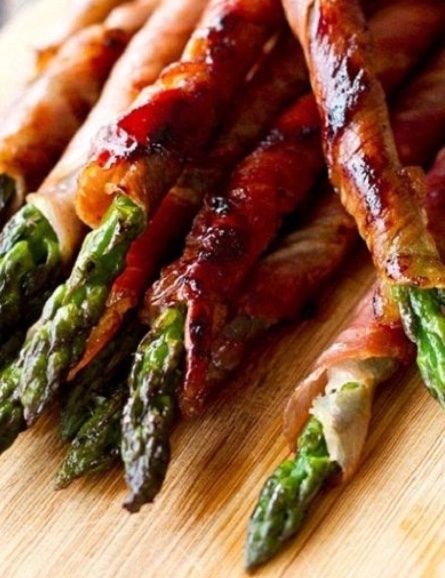 You will need to cut about an inch off from the bottom of the asparagus and wrap the prosciutto around going on a diagonal way (so you will start at 45 degrees and keep rolling). I like my vegetables “al dente” so I don’t cook my asparagus before wrapping but if you like your vegetables a little more cooked you can blanch the asparagus before wrapping. Just make sure they are well dried. After they are wrapped, cook them in a sautéed pan in a little olive oil until the prosciutto is nice a brown all around it (like the picture). If you want to make this ahead of time you can just cook them half way and finish them in the oven right before serving for about 5 minutes. Enjoy! Looks good, I will add this also to my menu.